On Tuesday Pierce started crying and saying that his ear hurt. So I made a doctor appointment for yesterday, reluctantly. 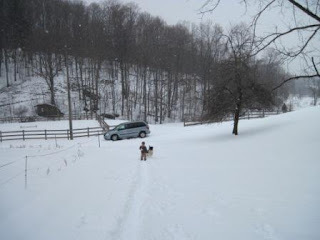 I dreaded having to lug all 3 kids all the way down the driveway in the snow, to where my car was parked at the very end of the driveway. 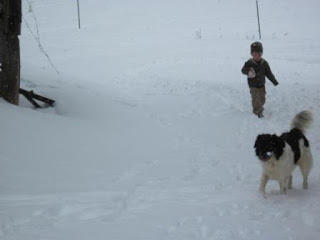 Pierce hates walking in the snow. 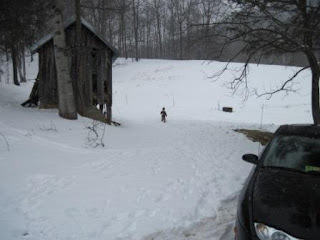 I had the two carseats in hand and Pierce stopped at the top of the driveway and refused to go on. It was sleeting. So I had to push on with the twins, my arms aching, until I could get them settled in the car. 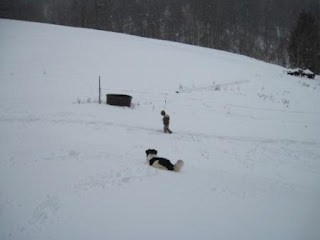 Then I had to run back up the hill to grab Pierce, who was snivelling in the sleet, to carry him down to the car. Not the best start to the day. Driving in so much sleet made me nervous, even though I knew it was just above freezing. 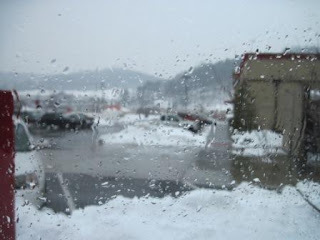 I had promised Pierce lunch in town with his Daddy, but snow started coming down so hard once we got to town I knew it would be a promise I'd probably have to break. I wondered if we should've stayed at home. However, as a kid who had a lot of ear infections herself, I am all too aware of how extremely painful they can be. And I didn't want Pierce to have to go through that. The pediatrician confirmed that Pierce did have an ear infection. They also confirmed that he hasn't gained any weight since his 3 year checkup in October. They aren't concerned. I'm freaking out and wondering if he should be switched to a diet of McDonald's and Hardee's. I also stooped to asking about Cort. I feel such guilt. Wasting the pedi's time (and him not even our usual doctor) by asking about one of the other kids, who didn't even have an appointment! 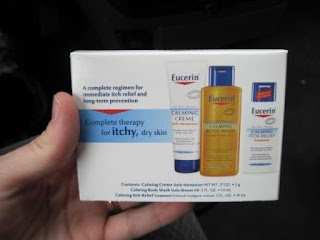 Cort has eczema. And he's itchy all.the.time. I'm glad I asked though. We got some samples! After the appointment (which involved a mere 5 fruit snack bribes to get on the scale, check each ear, open the mouth to say 'AH' and listen to the heart), we headed straight to Walgreen's to pick up the Rx. Where we were told that it wasn't there yet. And so. I asked Paul to pick it up on his way home from work. I was really worried about the roads. We headed home. I was able to get quite a bit closer to the house than before with the minivan. But it was still a long haul up a hill. I bribed Pierce with the promise of CHOCOLATE MILK (a rare delicacy in our house) if he would walk up the hill on his own this time. He did, with lots of complaining. It's all their fault. I never wanted any brothers anyhow. If I was an only child I'd be carried up this hill. Making me walk some five miles to the house in two feet of snow and SLEET while I have a raging ear infection. What kind of mother IS SHE? Is she taking PICTURES? That's it. I want a new mother right NOW. In a beautiful summary to our very long day, when Paul went to pick up the prescription, they claimed it was never called in. So today I get to deal with that. 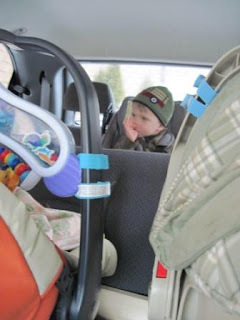 Oh, and have I mentioned how sore my arms are from the great carseat expedition of 2010? Turns out rural living has its cons. A whole winter full of them ;-) I blame the GROUNDHOG. You should let Pierce come stay with PopPop and CatCat for a couple of months. I will feed him all the stuff we eat. Since we both pack on pounds like crazy, he will probably weigh 20 pounds more by the end of that time. And you definitely need a new pediatrician. You old one should have called in a drug when you called on Monday and said Pierce was crying and not made you take those children out in sleet on Tuesday, let alone never calling in his medicine. Creep. Big double creep. He doesn't deserve a medical license. It turned out that they had called the prescription into the wrong pharmacy. It was the pharmacy we had on file that we used to use before they made me mad and we switched. Understandable mistake, huge inconvenience. Oh sucky hellish day! I hope you had a drink. I would've. I hope your boy is feeling better. Sick kids, it's tough on your soul. Hope you had a better day. My poor Pierce! When he becomes a father himself he can tell his kids that he had to walk two miles in the snow just to get to the doctor's! !